World Jungle’s Zumba Dancing Flash Mob for Sport Relief! 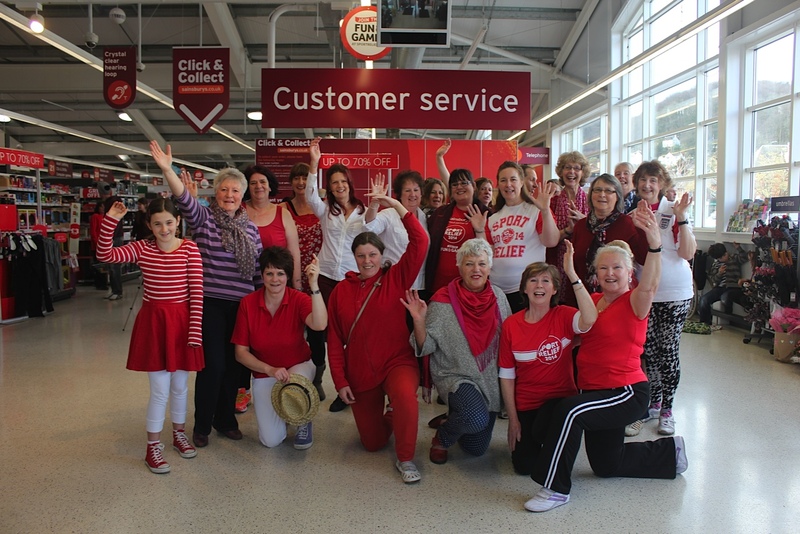 Saturday morning shoppers at Sainsbury’s in Dursley had a surprise last week when a Zumba-dancing ‘Flash Mob’ descended on the store – all in aid of Sport Relief 2014. The shop floor literally became a dance floor when members of local community organisation World Jungle’s dance and fitness classes performed ‘Madison Stroll’, inviting customers and staff to join in with the moves too. “We all had fantastic fun whilst raising money for a great cause. There were lots of familiar faces from our various Zumba Dance and Zumba Gold classes from across the area, all decked out in the Sport Relief red and white colours . Some customers and Sainsbury’s staff joined in too, copying the moves – I think we definitely brightened up a few shopping trips! The money raised from the event went towards the record breaking Sport Relief 2014 total of over £51 million. Zumba Dancing Flash Mob raising money for Sport Relief.